On July Fourth, we celebrate America’s birthday. What better way to do that than with wines from the US? 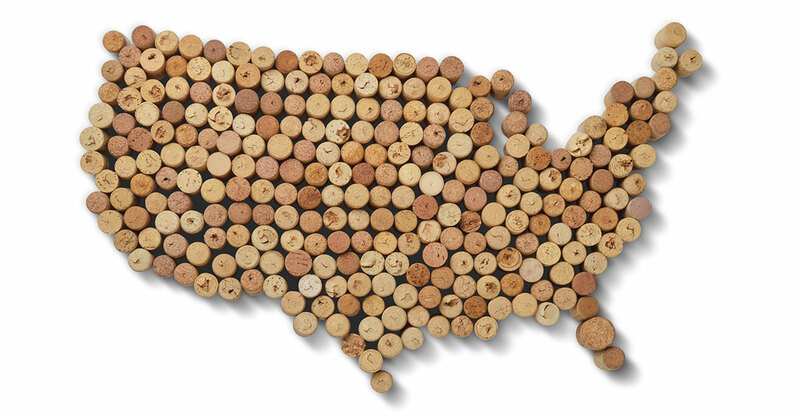 Wine is made in every state now, with the best-quality bottles coming from California, Oregon and Washington…and with New York, Texas, Missouri and Virginia not far behind. The following six all-American wines will please almost everyone at your July Fourth celebration and won’t cost you much at all—they’re all about $10 or just a few bucks more. You can enjoy every one of them alone before or after a meal…or make them the ­costars of the great food pairings I also have included. Great food pairing: ­Chicken, and especially chicken breasts or thighs marinated with garlic, parsley and olive oil and grilled on the barbecue. Why it’s worth buying: Line 39 is a California producer that is consistent from vintage to vintage, always a value, and offers widespread availability in grocery stores and spirit shops. With most inexpensive sauvignon blancs, all you get in the way of taste is lots of “citrus” in the front of your mouth. The Line 39 is a step up because besides the citrus, it gives you lemongrass and tropical fruit flavors in the front and middle and a sort of stony minerality when you swallow. Plus, there is the telltale California aroma of mown grass. In this, it’s not as tart as sauvignon blanc from New Zealand. Great food pairing: Seafood, be it shrimp on the barbie, fish or boiled crabs. Why it’s worth buying: ­Pinot gris is the same grape as pinot grigio and calling it pinot gris emphasizes the difference in style between the two. This is especially true for the J, which reflects its California origins. That means you won’t find the tonic-water approach common in Italian pinot grigos but a wine that has tropical fruit and almost honeyed aromas, plus melon and green apple flavors. The key here, though, and why it pairs so well with seafood, is an acidic zing that is welcome and refreshing. It’s even a little surprising, given how bland so many pinot grigios and pinot gris can be. I tasted this wine when I judged last year’s Critics Challenge competition, where it was named best pinot gris, and it reminded me how well-made it is for the price. Great food pairing: Almost anything smoked, be it brisket, pork shoulder or even salmon. Why it’s worth buying: Joe Dobbes, who makes this wine, is one of Oregon’s winemaking legends, someone who has been producing quality pinot noir in the Pacific Northwest for decades. His name on a wine guarantees quality, and especially at this price, given that decent pinot noir can cost two or three times as much—a savings of $15 or more. This is classic Oregon pinot noir, with the spicy, brambly quality that it should have, along with bright cherry fruit. Perhaps most impressive are the essential but subtle pinot tannins that complete the wine. The slight puckery feeling that the tannins produce in the back of your mouth completes the balance in this wine and is one reason it pairs so well with smoked meat and fish, offering a counterpoint to their fattiness. Great food pairing: Sticky, saucy barbecued ribs, ­whether pork or beef. Why it’s worth buying: The wine business calls this kind of wine a red blend, which is a euphemism for a sweet red wine—because, of course, we’re not supposed to drink sweet red wine. Bogle, perhaps the best inexpensive wine producer in the world, has made one of the best reasonably priced sweet reds. That’s because it’s not all that sweet, just barely on the sweet side of the scale that is used to measure that sort of thing. In addition, it’s more than just sweet, so it tastes like wine (with tannins and acidity) and not alcoholic Kool-Aid. It’s a juicy wine, with blackberry flavors, maybe a hint of cocoa, and not a rough spot at all. In all of this, it’s drinkable in a way that most sweet reds aren’t, because those wines are just about the extra sugar. And its slight sweetness is the exact quality that food with a sweet barbecue sauce needs—something to complement it and not to contrast. Great food pairing: Grilled sausages and pork chops, and don’t forget the ­sauerkraut. Why it’s worth buying: The McManis merlot is a revelation, a widely available inexpensive California red wine that tastes like it’s supposed to. Too many other merlots are jacked up with so much sweet fruit and fake oak (yes, even the pricier ones) that they make me sigh and reach for a glass of Spanish tempranillo instead. The McManis tastes like merlot—blueberry fruit, just the right heft for merlot (not as much as cabernet sauvignon but more than ­pinot noir) and a little of the silkiness that I expect to find in a New World merlot. Plus, the finish isn’t bitter or too short and even shows a little earth. Those are qualities that make it the ideal pairing with pork—better than a heavier wine that could easily overpower the food. Great food pairing: Almost everything, from grilled portobello mushrooms to potato salad to hamburgers and hot dogs. Why it’s worth buying: Layer Cake wines, available in grocery stores around the country, are famous for the picture of a cake on the front label. This California rosé, made with the pinot grape, is one of its best wines in years. The wine has tart red cherry fruit combined with fine, true-rosé-style acidity that gives the wine a fresh and crisp mouthfeel. There is even some flintiness in the back, and it’s not flabby or soft at all. In essence, it’s much more than just another grocery store pink wine.